Croatian Cuisine. Mediterranean - Feel good Food! 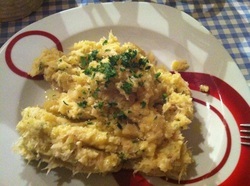 Bakalar na bijelo is traditional dish, but it’s not traditional only for Croatia but also Norway. Some of the best dishes of this kind are prepared from Norwegian cod (Gadus morhua), but throughout the history it also became Croatian specialty. It is prepared with cod and potatoes, cooked separately, spiced up with garlic, white wine, olive oli and some other spices characteristic for Dalmatia and Mediterranean area. The intense scent of cod and garlic is diluted with potatoes, which gives this dish a special note. cod to Mediterranean cuisine. An interesting fact is that, in the past, poor people ate dried cod, and only rich people ate raw cod, but throughout the time, things changed and nowadays dried cod is a delicacy that poor cannot afford. Also known as black dinner is a risotto made from sepia. 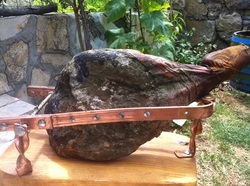 It is prepared especially in Dalmatia. 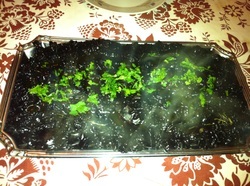 The specific note of this meal is squid ink, which boosts the taste of squid, spices and whole risotto. Croatian recipe for this dish is very similar to the Italian version, where this meal is also very popular, it is a common belief that recipe for Croatian black risotto probably originated in Venice and spread through Mediterranean. The squid ink has a special effect. It is a powerful anti-depressive. Sweet, salty and rich taste - very similar to the Spanish Serrano Iberico ham. Dalmatinski Prsut is still not a brand in Croatia with predefined (standardized) steps in the production process. But it is amazing to see what great quality some producers are able to produce. The "more or less" only secret of the real Dalmatian Prsut is the climate, right amount of salt and time (at least 12 Months). The cold wind from the mountains called Bura and the warm wind from the South called Jugo make this ham so special. If you order Dalmatinski Prsut and it does not have this juicy, sweet and rich taste - simpy ask for better quality. By doing that you will help improving the quality - some producers seem to be more money than quality oriented. On the long run this will help that Dalmatinski Prsut becomes a well recognized and unique brand in Europe.